Legendary drinks expert Salvatore Calabrese thinks we deserve better than the usual round of Christmas cocktails. You know the ones, the overly spiced mulled wines, the retro snowballs and the hot rum cows… That’s why the ‘Maestro’, as he is fondly called, has handcrafted five brand new winter warmers with a modern kick. Mix the whiskey, Galliano and pineapple. 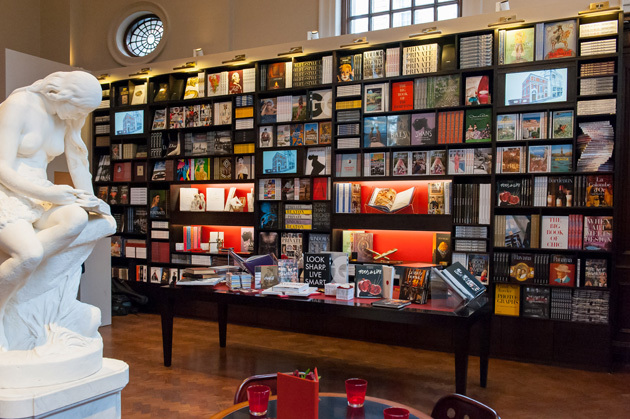 The first thing you notice upon entering Maison Assouline’s new Piccadilly flagship is the sheer volume and scale. Not just of the capacious open space with its mile-high ceilings, but the size of this French publishing house’s luxurious books. These range from pocket size to weighty coffee-table tomes, covering subjects from art to fashion, cars to photography. But there is one, which is guaranteed to stop you in your tracks; South Pole: The British Antarctic Expedition 1910-1913. This particular read is limited to 150 copies and is personally signed by the Princess Royal. Measuring 24 inches tall the book needs a table of its own to display it. What’s more, you can’t help feeling slightly like you are Alice in Wonderland as you try to turn the huge pages. To add to the store’s slightly off-kilter proportions a full-time bookbinder, Paolo Taddeo, is busy making private orders on archaic looking wrought iron paper presses. I’m told they date back to the 19th Century but they look as though they are sturdy enough to last another hundred years or more. Then there are the ‘Ariel Oxygen Cocktails’, served in Maison Assouline’s Swan Bar. Infused with ‘gemstone elixirs’, vitamins and minerals and whipped into a melted marshmallow consistency, they are served in enormous round glasses. Mine is absolutely delicious and I’m enjoying the hit of fresh oxygen as well as a tang of subtle rose petals. That’s not the only thing to make you wonder if you have entered a Carroll-esque world. Prosper Assouline who founded the brand in Paris with his wife Martine twenty years ago, is flitting about the place rather like the Mad Hatter. He is busy inspecting its own-label of bags and small leather goods and worrying that the scent of musky wood from its own line of candles may be a tad strong for the lunchtime crowd. This consists of local art dealers and fashion types who, unlike me, are snacking on luxury delicacies such as foie gras and Spanish ham, at tables clustered in the centre of the floor. As for the building, which sits right in the heart of Piccadilly, it measures 5,400 square feet. Originally designed in 1922 by Sir Edwin Lutyens it has been a bank and more recently home to contemporary art gallery, Hauser & Wirth. It also features a mezzanine balcony, which looks down to the books below and upstairs rooms showcasing vintage books and antiques, as well as bespoke shelving and sofas to furnish your own bibliothèque. Talking of parties, Assouline marked its official opening with the launch of its latest offering; ‘At the Emperors Table’, by Valentino Garavani. The Italian designer was on hand to sign copies, while guests including Anne Hathaway and Hugh Grant enjoyed the Krug champagne. What girl wouldn’t want to discover this lacy little number in her stocking this Christmas? Crafted from the finest Italian lace and lightly boned for extra support by seamstresses in Bologna, La Perla’s luxe bodysuit (£484) is too good to keep covered up. Wear it peeking out from underneath your tux jacket during the party season and you’ll be right on fashion’s lingerie-as-outwear trend. Other frilly delights such as the new Filigrane bra (£6,500) and matching briefs (£1,300), which are embroidered with gold macramé yarns can also be found at the lingerie specialist’s new Bond Street flagship. Set over three levels it features an entire floor dedicated to its newly launched VIP Made-to-Measure service. Here, each piece can be viewed in complete privacy from behind a swish sliding door. Sorry, no peeking here! When it comes to British fashion retailing and creating collections with a runway edge, Whistles CEO Jane Shepherdson is one of the most revered in the business. With a swish new womenswear flagship housed at number 30 Dover Street, just where does she go in search of French pastries and conceptual fashion labels? One of my favourite shops in London is the iconic Miu Miu store on the corner of New Bond Street. If I’m ever in need of a lift or a quick fashion fix that’s where I head and I’m rarely disappointed. The glittering displays of sunglasses, shoes and carefully curated clothing upstairs are always very tempting. After a visit to Bond Street I like to check out the Whistles’ collection. I nearly always end up buying something as the girls in the store look so good and persuade me to try on something that I wouldn’t normally go for. The last time I was there I ended up getting a monogrammed clutch bag for my sister’s birthday and a sheepskin gilet for myself. The VIP styling service is always a huge draw. This French restaurant is a wonderful calm oasis to drop into for a refreshment break mid-morning. Their pastries are so fresh and wonderfully moreish. Five floors of wonderfully eccentric clothes, accessories, shoes and jewellery all framed in a famously functional Mayfair townhouse. The Comme des Garçons collection alone is enough, but the Celine edit is perfect too. I often find myself in the store for hours, meandering from floor-to-floor, stopping for coffee and trying on pieces that I know I will never buy! The newest kid on the block is of course the Victoria Beckham store, which is a temple of sophistication just like its namesake. It is set in a beautifully restored house and is artfully curated with dresses to die for.